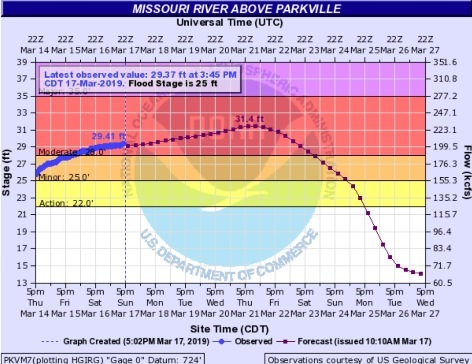 Rivers rise a little in Wyandotte County – Welcome to Wyandotte Daily! 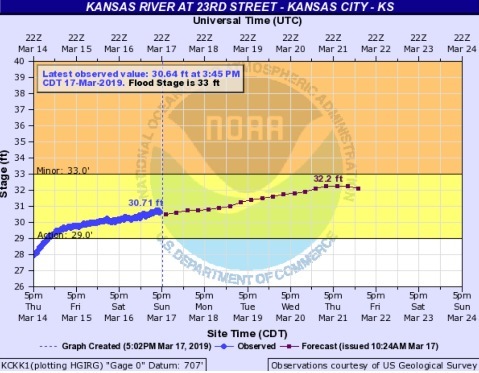 The Kansas River at the James Street bridge in Kansas City, Kansas, appeared high on Sunday afternoon. 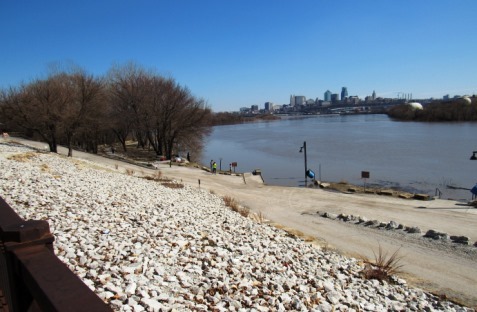 The location is near the confluence of the Missouri and Kansas rivers in Kansas City, Kansas. There was a little, but not much, water in areas next to the river. A glance at a few places Sunday afternoon in Kansas City, Kansas, showed the rivers rising, but not much flooding at this time. 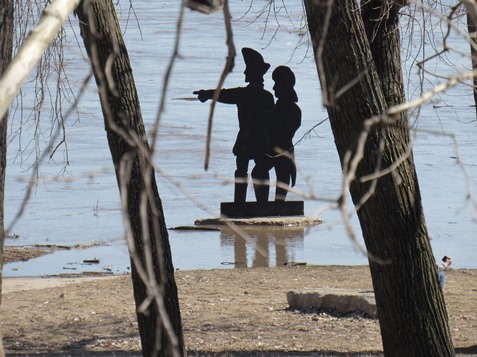 While Lewis and Clark, portrayed in a statue at Kaw Point in Kansas City, Kansas, appeared to be getting ready to get their feet wet in the Missouri River, the water level was not yet to the point of the 2011 flood. 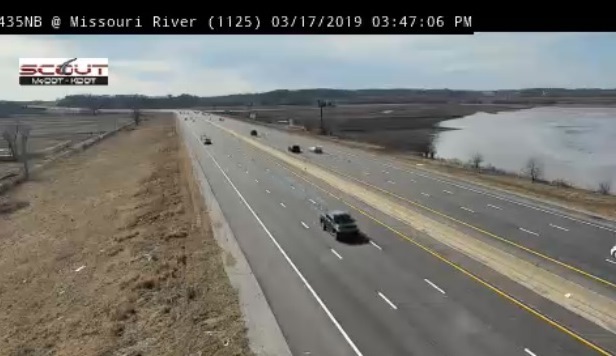 The fields around I-435 near the Missouri River in Wyandotte County were pooling some water, according to a KC Scout photo. The Kansas City, Kansas, police chief reported on social media that the police shooting range on the Missouri River was moved to higher ground. However, some communities in Nebraska and Iowa on the Missouri River were experiencing much more significant loss to flooding, with homes under water, and evacuations in flooded areas, according to officials. 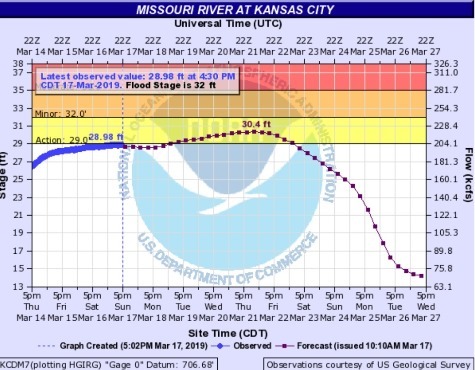 Closer to Kansas City, Leavenworth, Kansas, and Parkville, Missouri, are in the moderate flood stage, according to the National Weather Service’s latest hydrology reports. 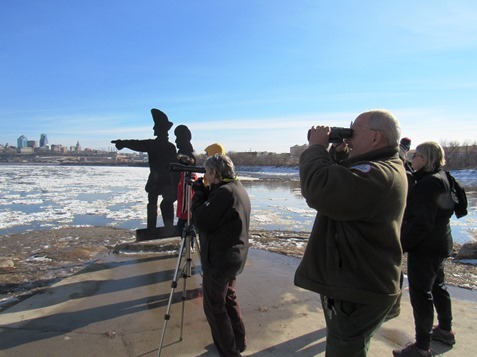 According to officials, a large amount of water was released upstream on the Missouri River on Thursday in South Dakota, as a result of large amounts of rain and melted snow draining into tributaries that flowed into the Missouri. 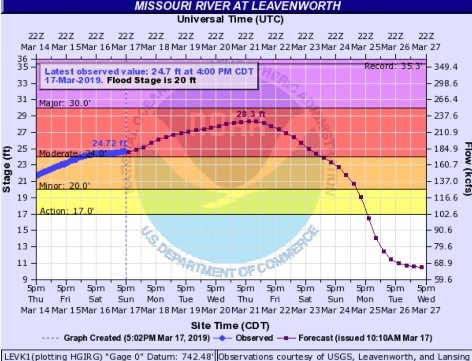 Last week, it was projected that the Missouri River could go into minor flood stage this coming week; however, today’s hydrology report from the National Weather Service has changed that to a peak of 30.4 feet, just under minor flood stage, on Thursday. The hydrology reports usually change every day. 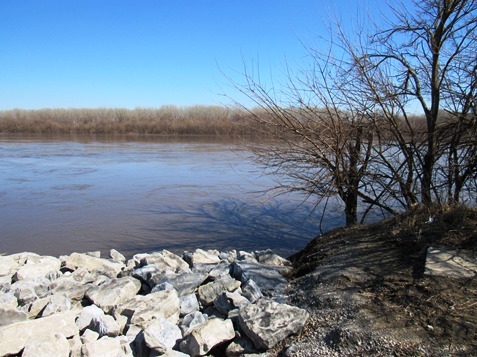 The river projections change because of alterations in the flow upstream caused by levees overtopping or breaching, and also because of weather forecasts calling for rain. The current weather service forecast calls for a quarter to a half-inch of rain possible on Tuesday in the Kansas City area. 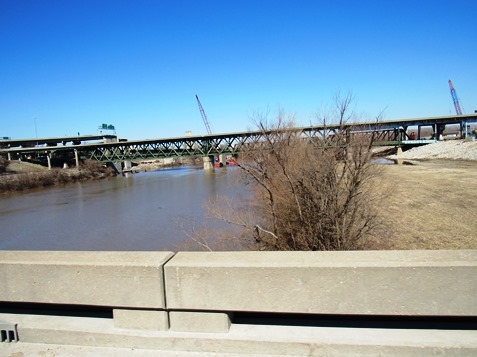 The Omaha District of the Corps of Engineers reported that many levees south of Omaha had been compromised and were either overtopping or breached. Officials from the Kansas City District Office of the Army Corps of Engineers are keeping an eye on the river. According to officials, the main areas of flooding they are currently working on are between Omaha, Nebraska, and St. Joseph, Missouri. There is still more melting snow up north that will be expected to go into the system by the end of this month, according to officials. Corps officials on Sunday said they had issued almost 400,000 sandbags already to communities to the north of Kansas City, and they had an inventory of 4 million sandbags available to assist communities. The focus of the Kansas City District was currently on Holt County in Missouri, Doniphan County in Kansas and Richardson County in Nebraska. 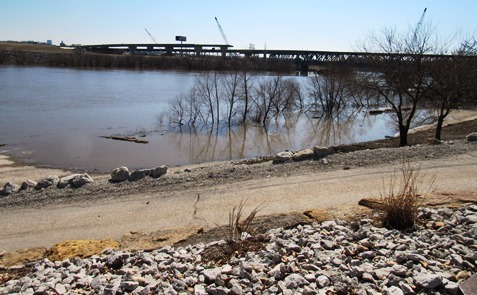 Five levees to the north of the Kansas City area were reported to have been breached or overtopped, according to corps officials. 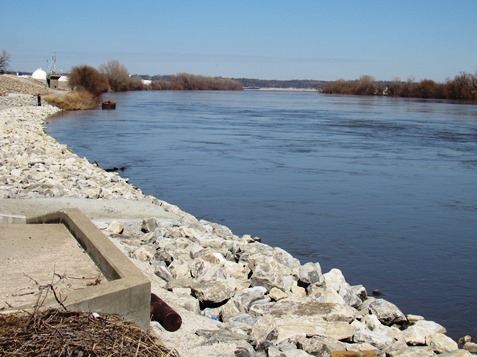 Another five nonfederal levee systems were at significant risk of overtopping, but were performing as designed currently, according to officials.